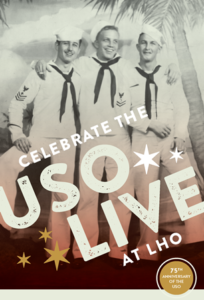 On Saturday night, join us to Celebrate the USO at LHO! Get ready for the big USO Show—a new performance created in partnership with the Ware Center’s Laura Kendall. Starring Jeremy “Bob Hope” Kendall and Robert “Bing Crosby” Bigley, and featuring three of Lancaster’s most talented musical ensembles—the Prima Sisters, Second Hand Suits and Temple Avenue—Celebrate the USO at LHO invites you to relive the magic of USO shows of the past when great entertainers like Bob Hope, Bing Crosby, and the Andrews Sisters brought joy and humor to our troops around the globe. Cash bar provided by Tellus 360. Come early and enjoy a picnic on the lawn before the show. Burgers, hot dogs, and ice cream vendors will be onsite. Tellus 360’s bar opens at 7pm. Tickets for the show are $10 per person. Children 10 and under are free to the show. Tickets will also be available at door for cash or credit. Please present advance tickets at ticket booth in order to be checked in and receive a wrist band.